The International Summit on Human Gene Editing took place in Washington D.C. a few weeks ago, underlining the critical attention continuing to follow CRISPR/Cas9 and its applications to genome editing. Recently I compared published protocols for CRISPR/Cas9 and a competing technique based on Zn-finger nucleases. Comparing the protocols suggests editing with CRISPR/Cas9 is vaguely simpler than using Zn-fingers, but didn’t discuss the biomolecular mechanisms underlying the increased ease of use. Here I’ll illustrate the fundamental difference between genome editing with Cas9 in simple terms, using relevant protein structures from the Protein Data Bank. 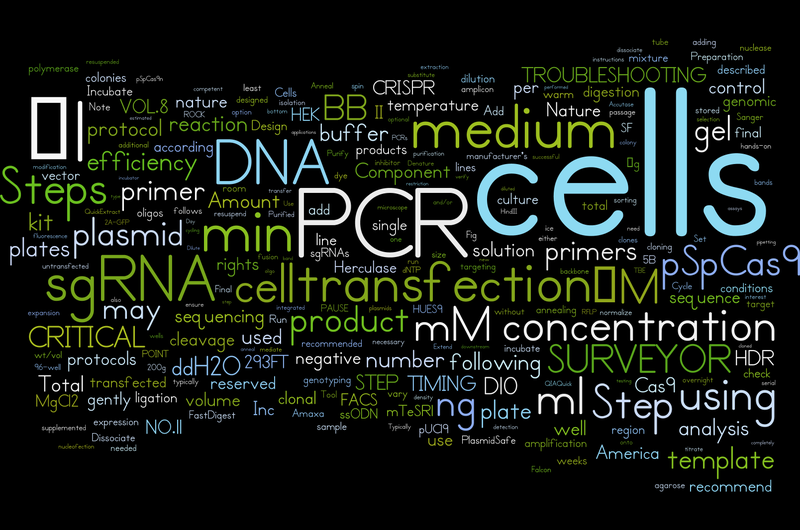 Each of the techniques I’ll mention here have the same end-goal: break double stranded DNA in a specific location. Once a DNA strand undergoes this type of damage, a cell’s own repair mechanisms take over to put it back together. It is possible to introduce a replacement strand and encourage the cell to incorporate this DNA into the break, instead of the original sequence. The only fundamental difference in the main techniques used for genome editing is the way they are targeted. Cas9, Zn-finger, and Transcription Activator Like (TAL) nucleases all aim to make a targeted break in DNA. Other challenges, such as getting the system into cells in the first place, are shared alike by all three systems. 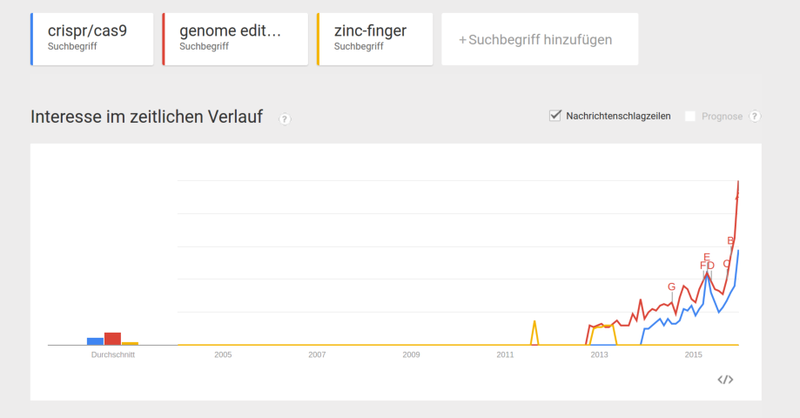 Zinc Fingers (red) bound to target DNA (orange). A sufficient number of fingers like these could be combined with a nuclease to specifically cut a target DNA sequence. Transcription Activator Like (TAL) region bound to target DNA. Combined with a nuclease, TAL regions can also effect a break in a specific DNA location. Cas9 protein (grey) with guide RNA (gRNA, red) and target DNA sequence (orange). The guide RNA is the component of this machine that does the targeting. This makes the guide RNA the only part that needs to be designed to target a specific sequence in an organism. The same Cas9 protein, combined with different gRNA strands, can target different locations on a genome. 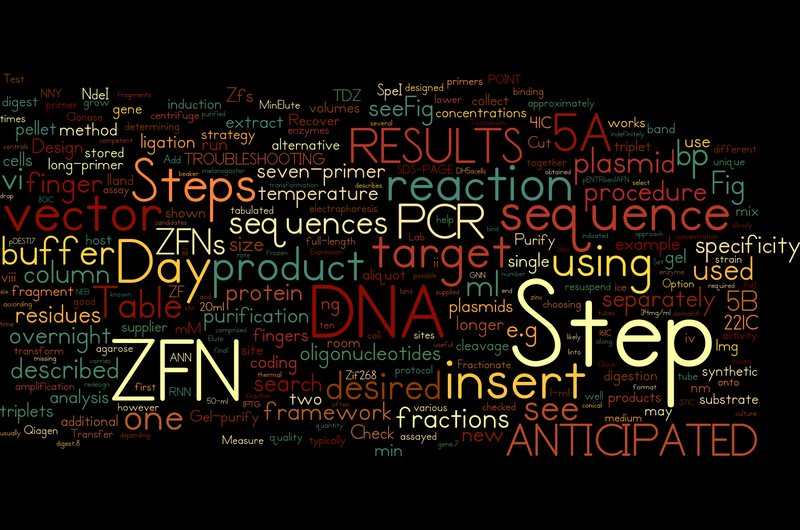 Targeting a DNA sequence with an RNA sequence is simple. RNA and DNA are both chains of nucleotides, and the rules for binding are the same as for reading out or copying DNA: A binds with T, U binds with A, C binds with G, and G binds with C . Targeting a DNA sequence with protein motifs is much more complicated. Unlike with nucleotide-nucleotide pairing, I can’t fully explain how these residues are targeted, let alone in a single sentence. This has consequences in the initial design of the gRNA as well as the efficacy of the system and the overall success rate. So the comparative ease-of-application stems from the differences in protein engineering vs. sequence design. Protein engineering is hard, but designing a gRNA sequence is easy. To associate the guide RNA to the Cas9 nuclease, the targeting sequence has to be combined with a scaffold RNA which the protein recognises. With that sequence we could target the Cas9 nuclease to the acetaldehyde dehydrogenase (ALDH1B) gene, inducing a break and leaving it open to replacement. The scaffold sequence above turns back on itself at the end, sinking into the proper pocket in Cas9, while the target complement sequence coordinates the DNA target, bringing it close to the cutting parts of Cas9. If we introduce a fully functional version of the acetaldehyde dehydrogenase gene at the same time, then we surely deserve a toast as the target organism no longer suffers from an abnormal build-up of toxic acetaldehyde. Practical points remain to actually prepare the gRNA, make the Cas9 protein, and introduce the replacement sequence, but from an informatic design point of view that is, indeed, the gist. That’s the basics of targeting Cas9 in 1,063 words. I invite you to try and explain the intricacies of TAL effector nuclease protein engineering with fewer words. That’s C for cytosine, G for guanine, U for uracil, and A for adenine. In DNA, the uracil is replace with thymine (T). Acetaldehyde is an intermediate produced during alcohol metabolism, thought to be largely responsible for hangovers. A mutation in one or both copies of the gene can lead to the so-called “Asian Flush”. What’s the big deal with CRISPR/Cas9? Cas9 (grey) in complex with yellow guide RNA and red target DNA. 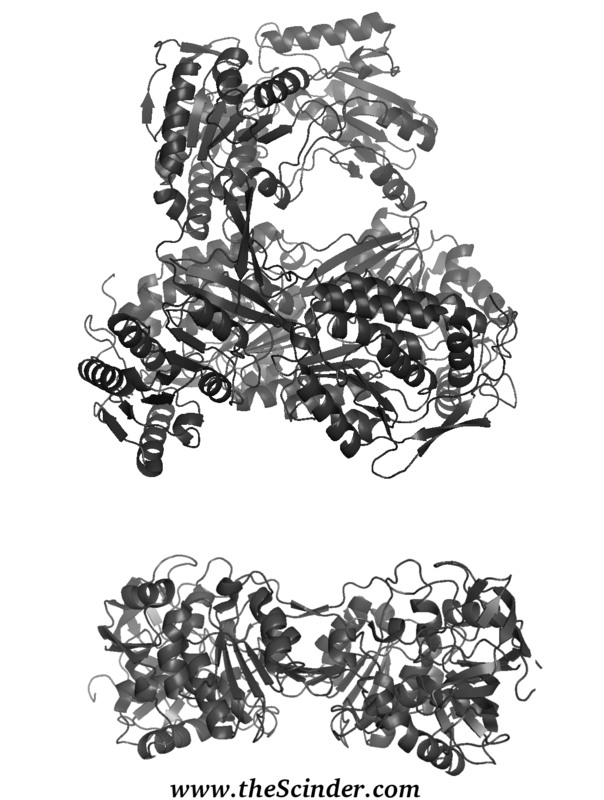 PDB structure 4oo8 manipulated in PyMOL by yours truly. Cas9, like competing genome editing technologies (TALENs and ZFNs), is a nucelase. Click to view animated GIF. Summary: Eliminate hereditary diseases. Re-program pathological tissue. Design babies. Bring back the T. rex. The peril and promise of genetic engineering has been a long-time coming. Generally speaking, none of the wonders we began collectively imagining with the deduction of DNA structure in the 1950s have come to fruition. At the turn of the millenium with the completion of the human genome project(s), we expected personalized medicine to eradicate inefficacies and side effects in modern medicine. Current development based on bacterial immune systems promises to either revolutionise the treatment of genetic disease or fill the world with ten-foot tall babies shooting lasers out of their perfect blue eyes while playing professional basketball and winning Nobel Prizes. My first foray into a wet lab consisted of a project straight out of the astounding futures your favourite sci-fis promised you- or warned you about: incorporating functional genetic elements from humans into fungal cells. After a summer spent pushing the limits of what is possible and blurring the lines of what it means to be human, I created a terrible organism neither man nor yeast. Unable to find acceptance among people and no longer satisfied by nature’s intentions, these fungal colonies, the bizarre offspring of one man’s twisted mind and leavening products found the cruel world to be too much and jumped into an autoclave while reciting Macbeth. 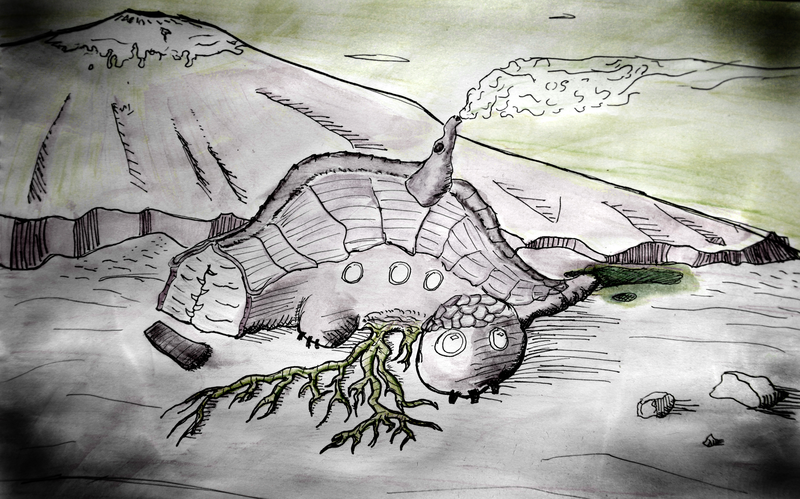 Despite the hyperbolic passage above, the monsters yet live. The strain ended up in a laboratory-grade freezer at negative eighty degrees (Celsius, of course, the lab being free of both astrologers and barbarians). The little yeasties are probably still chilling in the small cardboard box where I left them, covered in frost and enjoying a nice bath of glycerol cryo-protectant, traveling through time in suspended animation until the world is ready for them. The human genes and their counterparts in baker’s yeast are similar enough that in this case one could substitute for the other (at least in one direction). The function of these metabolic keystones known as ATP synthases is an ancient one: churning the potential energy of an electron gradient to make the cellular energy storage molecule adenine triphosphate (ATP). They are primeval enough that the human version acts as a suitable stand-in for a strain of Saccharomyces cerevisiae otherwise incapable of aerobic respiration. I had precisely engineered a genetic vector that inserted directly into the location of the yeast’s genome where the native version had been removed. 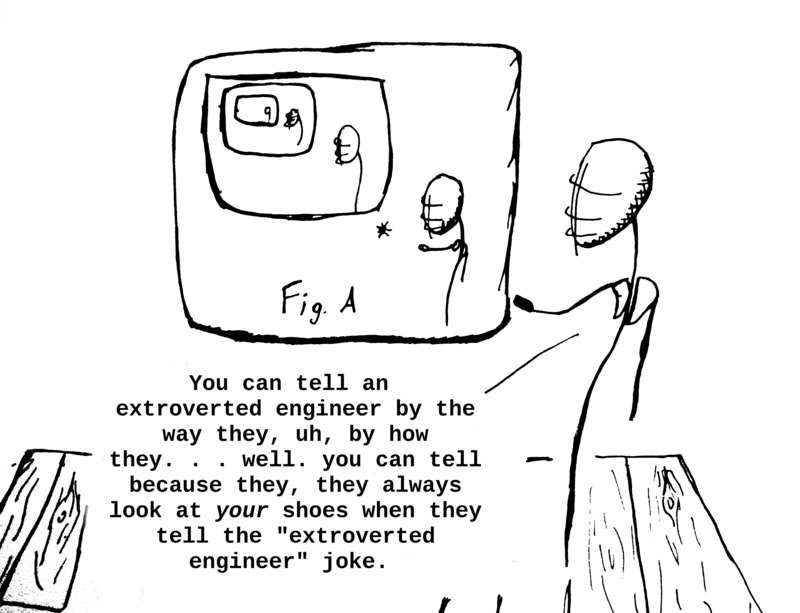 And by “precisely engineered” I mean that it was so easy, an undergrad could do it, as I did. 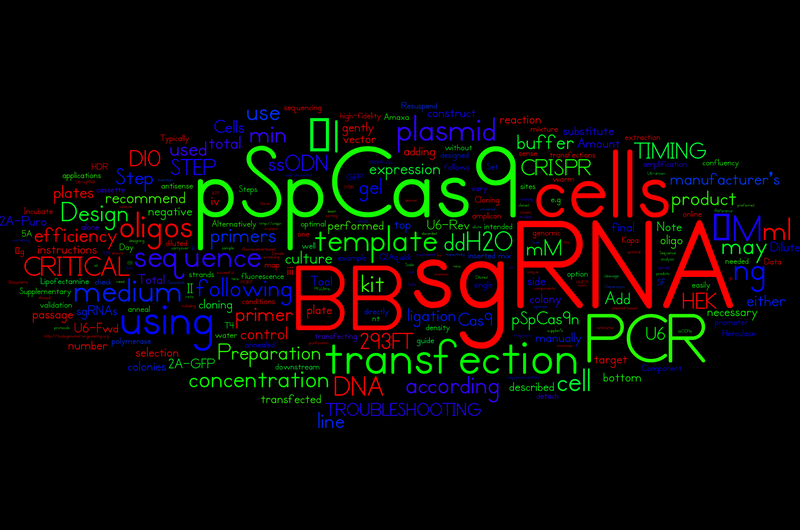 Recently a technique based on CRISPR (Clustered Regularly Interspersed Short Palindromic Repeats) and CRISPR-Associated Proteins (such as Cas9) has garnered a lot of attention in the press as well as the scientific community. The word-sequences up-regulating all the excitement highlight the ease and effectiveness of CRISPR/Cas9 over previous methods. The technique’s critical reception has run the full range from drooling anticipation to worried alarm to bad puns. Since my early days in the lab playing as a god with design of human-yeast splices, I’ve continued down the rabbit-hole of biological scale to the point that I now work more often with the single molecule(s) of biomolecular machinery than with cells directly. 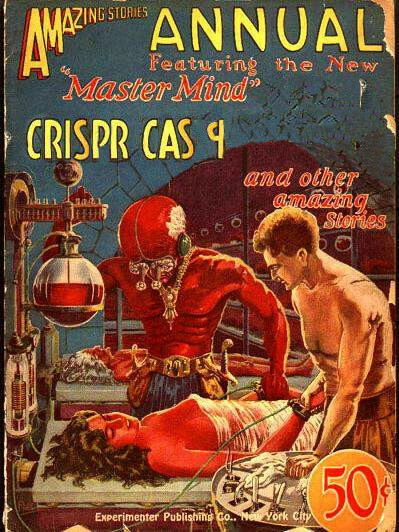 So I’m certainly out of the loop and out of a practical grasp of the rational underlying CRISPR/Cas9 genome editing. After all, spider silk proteins have been produced in mammalian cells since before 2002, and are regularly produced in goat’s milk. Does CRISPR/Cas9 change the game to such a degree that warrants the flood of interest? I’ll skip over the high-level technical overviews that you’ve probably read before, but for those with the time and interest I can recommend Jennifer Doudna’s Breakthrough Prize lecture. Instead I’ll compare two protocols, the first based on CRISPR/Cas9 and the second based on an older technique using another type of engineered nuclease known as zinc-finger nucleases (ZFNs). I scraped both protocols from the same publication, so apparent differences due to style should be small. To get a sense of the complexity of each technique, here are the two protocols as wordle word-clouds, displaying the size of the 256 most frequently used words in each protocol according to their relative usage. The table below compare the complexity and length of either protocol. The reading complexity measures were generated with this tool, and in short the first measure decreases with increased complexity while the second two increase with added complexity. The associated Wordle even looks a bit friendlier. So suffice it to say that it’s not easy to see the underpinnings of the excitement surrounding major developments such as CRISPR/Cas9. Essentially the advantages of the CRISPR-based approach stems from the level of difficulty of engineering guide RNAs versus engineering DNA-binding domains based on amino acid residues required for competing techniques ZFNs and TALENs (not compared here). In the brewer’s yeast I modified “back in the day,” targeting the desired genes to the desired location was as simple as including a sequence from the target location on the DNA to be inserted; there are sufficient double-stranded breaks in a flask of yeast culture to allow the gene to find its target a few times. With the specifically targetable nucleases such as Cas9, Zinc-finger nucleases and TALENs, one doesn’t have to count on such an easy model organism to precisely manipulate a small number of cells for a desired change to the genome. The increased interest alone is sure to drum up funding, public intrigue, and private investment, driving the impact forward as a self fulfilling prophecy. The more interested and excited people are for CRISPR/Cas9, particularly those people with the deep pockets to fill out scientists’ salaries, the more the technique will be subjected to use and refinement. More people using the tool drives the potential for meaningful breakthroughs. On the other hand, we have been promised and warned of this same onrushing biopunk dystopia before, and as they say: if this is the future, where are my gene-driven superpowers? Author theScinderPosted on December 14, 2015 December 31, 2016 Categories EssaysTags CRISPR/Cas9, genetic engineering, Genome editing, goats, mad science on the benchtop, spider silk, ZFN, Zinc-finger nuclease, Zn-finger nuclease1 Comment on What’s the big deal with CRISPR/Cas9? Congratulations on the purchase of your new home (embryo)! Even as you read this brief a HouseSeed will have been set on a ballistic trajectory, weather permitting, through our beautiful red sky to the location of your choice (or suitable alternative). In some rare cases we may deviate the initial homestead site of your choosing to an equally fantastic one based on our own proprietary databases. This ensures good access to local methane vents and water supplies and ensures that it will be a carefully calculated minimum safe distance from any reported semi-sentient mining equipment gone rogue, without threatening other company interests or negotiations. You will join many satisfied GrownHome™ owners who have chosen to trade the hustle and bustle of the city for simple, luxurious country living. A true “home away from dome”, your new house will be completely self-sufficient from the day you first move in. Gone are the days when the dream of a Martian homestead to call your own meant relying on a weekly (expensive) supply of essential goods by rocket delivery from the city. Tired of ordering from a paltry catalog of choices between nondescript, lyophilised nutrient dust on the one hand and greenhouse veggies that cost an arm and a leg? Nobody wants to pay those prices, even if you’ve got a whole vat of extra limbs at your local BodyBank™, and now you won’t have to. After a short (and mostly harmless) calibration period your house will adjust to perfectly match your specific caloric and micronutrient needs, producing a range of pleasing colours and flavours of fruiting bulbs. Your GrownHome™’s homegrown food is a hardy engineered derivative of Terran mushrooms, algae, and other organisms and it’s so good we’ve taken to calling it MarsManna (patents pending). We think in time that you’ll feel the same way, and the mild calming psychoactive compounds produced in the bulbs guarantees you will! You would think that surely this food-production process must be expensive, and well, you’d be dead wrong*! Every bite of food you eat will first be processed on site by regenerative processes in your new home’s cloaca. Smart and efficient! Clean, fresh drinking water is similarly maintained in a closed loop system. After an initial searching phase in which a network of fine rhizomorphic fibrils starting at your home site permeates the nearby countryside, scavenging all available moisture sources, your house will iteratively re-cleanse your water supply ad infinitum. The initial growth phase of your abode is powered from orbit by our network of orbiting microwave lasers, but as the house begins to undergo differentiation we follow a precise schedule of decreasing power designed by our expert engineers. This generates selective pressure on the population of cells making up the outer walls of your home to produce pigments more suited to harvesting energy from the dim sunlight and ionising radiation environment of Mars. Your new house’s unique skin (as no two houses evolve to produce exactly the same pigment repertoire) generates energy while protecting you and your family from the deadly exterior environment. A dense layer of Mars dust (locally sourced and absolutely sustainable) is collected by architectural mucous membranes during the embryonic growth phase, providing additional radiation protection. Native bacteria in the dust undergo a rapid metabolic burst when they encounter the nutrient-rich membrane, producing excellent insulation in the form of a carbon dioxide bubble matrix, before the house envelops this with a thick protective skin. The bacteria expire naturally and harmlessly as a result of their own production of reactive oxygen species, leaving no clean-up and posing absolutely no health risk**! After the orbiting power source is removed (and allocated to other GrownHome™ homesteads- you won’t be all alone out there forever!) patterned waves of epigenetic control molecules permeate the floorplan. This drives segmentation and specialisation of your home sweet home. No boring spherical hermit huts here! Unlike our small-dreaming competitors, Mars Hermit Huts Ltd., all GrownHome™ houses develop at least three distinct sections with no limit to the creature comforts therein. Each house is unique, but depending on the developmental regime you selected you can expect to come home to a fine kitchen, cozy living room, and a classy bar. Your new home even produces its own ethanol as a metabolic byproduct***! When your home reaches its final form, a genetically engineered Brilliant Actually alIve Neural Network (BRAINN) will awaken to control life support, airlocks, and communications interfaces to the outside world. You won’t even have to bother with the hassle of a thermostat because your house is smart enough to select the perfect temperature for you. Rapidly learning from your natural speech patterns, your house will soon be able to tell you about your schedule, the news and weather, and as an added bonus, tell jokes! It may feel awkward at first talking to an empty house but before long your new home will talk back! Note that your home’s nervous system is classified as a Type III non-sentient software under Article 7 of the Turing convention. If your home begins to display any of the following traits, please contact your local authorities: sarcasm, angst, possessiveness, jealousy, depression megalomania, malice, introspection, vanity, or free-will. Welcome to the GrownHome™ family. We just know you’ll have no complaints! **If you notice green or black spores or experience internal bleeding of any kind contact your physician for immediate sterilisation. ***For a subscription to one or more of our palliative mixture juices or fusel detox drops, visit our website.